It's a challenge sometimes to introduce color into kitchens because cabinetry is a long term investment and color trends vary over the years. Homeowners will often ask, "What if the color I like today looks dated and old after a few years?" This concern is certainly valid and designers can listen and question attentively to discern how comfortable each homeowner is with introducing color into their kitchen. It's interesting to note that right now, white kitchens are trending very high in popularity. Not only are white kitchens a timeless and classic look that works well in traditional, transitional and contemporary designs, but they also work well with all colors. Oftentimes, designers will suggest going with a neutral color palette for long term investment items like cabinetry, flooring and carpet, and introducing color on the easily updated areas like pillows, throws and wall paint colors. This is certainly the norm with furnishings, where a couch is a neutral color and the throw or pillows adds a pop of color. A similar idea can be used for the kitchen where the cabinetry is a more neutral color and other items in the kitchen utilize color. If you love color but you're just not convinced on how to incorporate it into your new kitchen, here are a few ideas to consider. Introduce your favorite color in the stools or other soft goods that can be easily changed or updated when your preference changes. 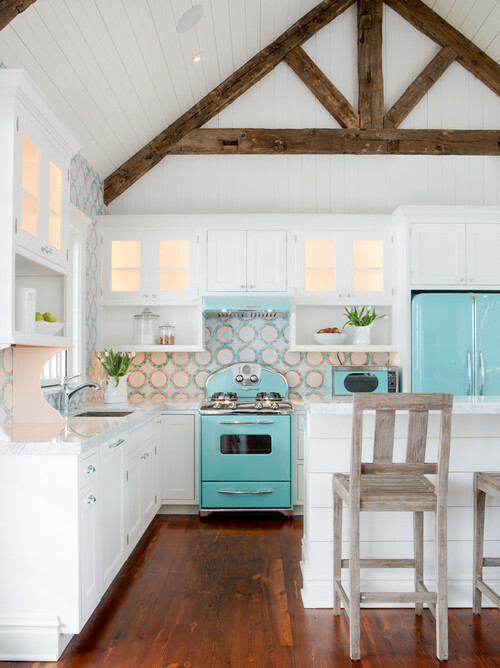 Introduce a pop of color by painting one wall within the kitchen. This too can easily be changed or updated at a later date and looks great with any color of cabinetry, especially white.